The three-color national flag of Azerbaijan was accepted by the government of the Democratic Republic of Azerbaijan on November 9, 1918. After the collapse of the Democratic Republic in April 28, 1920 and the establishment of the Soviet regime this flag was relinquished in Azerbaijan. Yet the flag was restored by the order of the Supreme Mejlis of the Nakhchyvan Autonomous Republic and was declared the national flag of the Autonomous Republic on November 17, 1990. 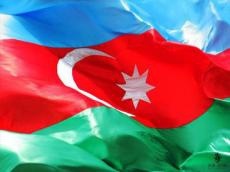 At the same time the Supreme Mejlis of Nakhchyvan Autonomous Republic petitioned to the Supreme Council of the Azerbaijan SSR for recognition of the three-color flag the national flag of Azerbaijan. The Supreme Council of the Azerbaijan Republic considered the petition of the Supreme Mejlis of Nakhchyvan Autonomous Republic and approved the three-color flag the national flag of the Azerbaijan Republic on February 5, 1991. On November 17, 2009, President Ilham Aliyev signed order on celebrating November 9 every year as the State Flag Day in Azerbaijan. This flag, which is the memory of the People’s Republic of Azerbaijan, was adopted on November 9, 1918 in the sitting of the Government of the People’s Republic. According to the order, November 9 every year is celebrated as the State Flag Day of the Republic of Azerbaijan. After the Republic of Azerbaijan restored independence, the State Flag of Azerbaijan has become one of the sacred attributes of statehood to all citizens of our country as the symbol of national sovereignty. As the memory of the People’s Republic of Azerbaijan this flag demonstrates our devotion to the idea of liberty, national and moral values and universal ideals. The State Flag of the Republic of Azerbaijan was adopted in the sitting of the Government of the People’s Republic of Azerbaijan and possessed the public status till April 1920. That flag was approved as the State Flag of the Autonomous Republic of Nakhchyvan in the session held on November 17, 1990 at the initiative and under leadership of Chairman of the Supreme Assembly of the Autonomous Republic of Nakhchyvan, national leader Heydar Aliyev. On February 5, 1991, the Supreme Soviet of the Republic of Azerbaijan designated the flag as the State Flag, adopting Law ‘On the State Flag of the Republic of Azerbaijan’. With the Constitutional Act ‘On state independence of the Republic of Azerbaijan’ of October 18, 1991, the Republic of Azerbaijan restored the state attributes, including the State Flag of the Republic of Azerbaijan as its legacy. Adoption of Law of the Republic of Azerbaijan ‘On the rules for the use of the State Flag of the Republic of Azerbaijan’ on June 8, 2004 improved the legislative source in this field. The State Flag is raised on the buildings of public agencies and diplomatic representations of our republic, personifies the national unity in influential ceremonies, assemblies, large-scale public-political meetings, cultural events and sport contests. Order of the President of the Republic of Azerbaijan ‘On creation of the State Flag Square in Baku City, the capital of the Republic of Azerbaijan’ of November 17, 2007 determines the special place of the State Flag among the state attributes. The State Flag Day is day off.